Corporate security is capable of effectively identifying and mitigating or managing any developments that have the ability to threaten the continuous survival and resilience of a corporation. It refers to a corporate function capable of overseeing and managing close coordination of functions within a corporation that are primarily concerned with safety, security and continuity. This function also involves the implementation of security measures as a means of ensuring that physical items, network used and company-owned ideas are well-protected. It also plays a major role in financial investment because it is effective in protecting investors. If you are one of the major owners of a corporation, then it is advisable for you to gather information about corporate security so you will know exactly how to protect everything that forms part of your company. When it comes to implementing corporate security, you have to take note that its core elements include personal security, information security, physical security, corporate governance, fraud deterrence, crime prevention and detection, compliance and ethics programs, business continuity planning, risk management, investigations, crisis management, safety, health and environment. One of the major roles of corporate security is to convince all employees to promote security all throughout their daily actions and decisions. It also performs the change management function and works in ensuring that the social networks of your corporation remain protected. It also aims to take risks instead of preventing them and respond to new concerns that your business faces. 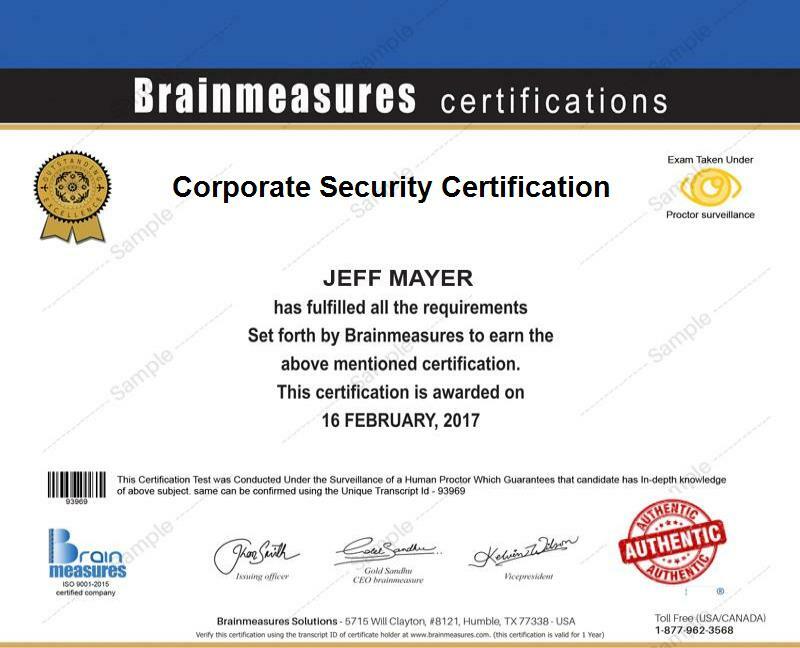 Gathering information about corporate security is no longer that hard at present because Brainmeasures which has become recognized worldwide for being a highly reliable and effective online certification company now includes a corporate security certification course among its many offers. The corporate security course offered by this company is developed by real corporate security experts and this further increases the level of its accuracy and effectiveness. Enrolling in this certification course allows you to undergo a corporate security training which allows you to master all the important aspects related to this vital function, the many core elements and components that it holds, its major functions and roles and the many corporate security techniques that you can use in protecting everything about your business including your physical properties, intellectual properties and network. Receiving your corporate security certificate works in showcasing your impressive knowledge and skills in the field of protecting your entire corporation. How to establish and effectively manage a corporate security department? How to effectively deal with conflicts in a security department? Considering the extreme importance of protecting all the assets and elements of an organization from threats, vulnerabilities and risks, it is safe to assume that enrolling in a corporate security certification course can benefit numerous individuals and professionals. The certification course is more beneficial for individuals and professionals who are responsible in protecting all the major elements of a corporation including corporate security managers, chief security officer, security solutions head, global risk analyst and safety advisor. Receiving a corporate security certification can also help you obtain a more stable pay. With the help of your corporate security certification, you will be able to get employed as a corporate security manager which often offers a salary of approximately $86,000 to $103,000 annually. You can also expect to earn higher if you work as a corporate security consultant because this profession gives you the opportunity to receive around $94,000 to $136,000 per year.